I have some interesting news. It looks like Khvalynsk_Eneolithic I0434 can be used as essentially a perfect proxy for the Eneolithic steppe trio from Wang et al. 2018 when modeling the ancestry of the Yamnaya people of what is now the Samara region of Russia. Consider the qpAdm mixture models below, sorted by taildiff. One of the best fitting models that also fairly closely matches archeological data, which suggest that Yamnaya was an amalgamation of the Khvalynsk, Repin and Sredny Stog cultures, is in bold. The worst fitting, and basically failed, models are listed below the dotted line. Note that almost all of these models feature reference populations from West and Central Asia. Why is this potentially important? Because unless Khvalynsk_Eneolithic I0434 was a recent migrant from the North Caucasus piedmont steppe, which is where the remains of the Eneolithic steppe trio were excavated, then Yamnaya's ethnogenesis might not have anything at all to do with Asia or even the Caucasus region. At least not within any reasonable time frame anyway. Here's a map showing the geographic locations of all of the populations relevant to the highlighted mixture model above. I won't be fussed if it turns out that the majority of the ancestry of the Yamnaya, Corded Ware and other closely related ancient peoples was sourced from the Eneolithic populations of the North Caucasus piedmont steppe. But I think it's useful to make the point that there are still very few ancient samples available from the steppes between the Black and Caspian seas, so we don't yet have much of a clue how the groups living throughout this region during the Eneolithic and earlier fit into the grand scheme of things. Update 24/12/2018: I decided to repeat the analysis, but this time with Caucasus Hunter-Gatherers (CHG) as one of the outgroups (or right pops). The reason I initially didn't include CHG in the outgroups was because I didn't want to discriminate, perhaps unfairly, against West and Central Asians with high levels of CHG-related ancestry, and in favor of Europeans with no or minimal CHG-related input. But in my opinion, the new results clearly make more sense, with Sredny Stog and Varna at the top of the list. Update 17/02/2019: I basically managed to confirm my analysis with samples from the Wang et al. Caucasus paper. See here. 10434 was the one who had Q1a, right? Where would the CHG related(formerly "teal")ancestry have come from in this scheme? It's hard to say, because in mixed populations uniparental markers are often decoupled from the types of genome-wide ancestry that they arrived with. From memory, I0434 also belongs to mtDNA haplogroup U4, which doesn't seem like an obvious CHG marker. But who knows, maybe his maternal ancestry was mostly of CHG origin despite this? I think that U4 is(currently) real thick around the Samara bend, actually, at least it is on the mt DNA maps I've seen. Good chance the maternal ancestry was local, then. Interesting. By the way, Meshoko and Maykop are very similar to Armenia_EBA, so I reckon when I try this model with them the results will fall below the dotted line. Don't know what will happen with Steppe Maykop, but I'd expect a pretty bad fit because of too much East Asian-like stuff. Looking at more maps of U4's present distribution, it's really thick around both the Samara bend, and the caucuses, especially the western caucuses. Spitballing here, but maybe it was widely distributed between those two areas at one time, and the bulk of it was gouged out of the middle by later events? Did U4 originally come from Mesolithic Caucasian foragers, along with that Y-haplogoup J in the Karelian sample? It just might have. Apparently this guy has either U4a2 or U4d. So I don't really know what that means, but even if U4 wasn't a marker present in CHG, it still may have arrived in the Samara region with CHG-heavy groups from the North Caucasus. But he did have more CHG than the other Khvalynsk guys, right? And he was apparently killed and buried like a second-class citizen, as I recall? Also, there is a chunk of U4 in Wang's Caucasus cluster. Yeah, he has as much CHG as Yamnaya. Are U4a2 and U4d not both typically northern European (Germanic, Slavic, Baltic, Finnic) mtDNA haplogroups at present? U4a is found in Steppe related samples and U4b in Caucasus Eneolithic related samples. Even if there is a common origin, U4 is something like 15000 years old. And U4a, even if younger than U4b, something like 8000 years old. So, in any case, thousands of years before Yamnaya and even Khvalynsk. So the Wang et al's Caucasus Cluster is not even a good source for CHG found in Yamanaya/Khvalynsk... even if you take into account only Mt haplogroups. Even if sampling is limited, we have tens of Steppe samples now (including derived populations), so the absence of U4b is not that easy to explain. Guys does anybody know when this huge paper with the Yamnaya and generally the Steppe populations from Hungary and the Carpathians DNA is going to appear? It would be a stretch to consider that there was *no* interaction between the steppes and the caucuses, considering the shared cultural and technological innovations alone. E.g., kurgans in Azerbaijan and Georgia in the early 4th millennium (predating Yamnaya) that must fit into the picture. The interesting question that surfaces is when EHG and CHG came together to form the relevant western steppe cultures, and more generally, the ANE/EHG/CHG dynamics that we now know have been playing out for a really, really long time. We simultaneously have seemingly unadmixed EHGs and CHGs until pretty late, varying admixed EHG/CHG people, and even crazy early CHG in ANE(?)... all just makes things a bit muddy. Seems pretty reasonable; assuming the 3 Khvalynsk individuals were representative of the general population, then it's hard to make that work as an ancestor for Yamnaya... (because it's tough without a "pure" CHG source and none seem to be about). *But* if it turns they actually are not representative and "Khvalynsk" is either a population mostly like the Q1a guy I0434, or has a lot of substructure where the more EHG individuals (the R1s - very high status / rich R1b1 I0122 and more intermediate status I0433 R1a1) were more or less excluded as contributing much ancestry to later populations, then more is possible (along the lines of this posts model). Three individuals described here were among 39 excavated in 1987-88 at the Eneolithic cemetery of Khvalynsk II, Saratov oblast, Russia, on the west bank of the Volga River, 6 km north of the village of Alekseevka. Khvalynsk I and II are two parts of the same cemetery, excavated in 1977-79 (Khvalynsk I) and 1987-88 (Khvalynsk II).23 The two excavations revealed 197 graves, about 10x larger than other cemeteries of this period in the Volga-Ural steppes, dated by radiocarbon to 5200-4000 BCE (95.4% confidence). Bones of domesticated cattle and sheep-goat, and horses of uncertain status, were included in 28 human graves and in 10 sacrificial deposits. The 367 copper artifacts in the graves, mostly beads and rings, are the oldest copper objects in the Volga-Ural steppes, and trace elements and manufacturing methods in a few objects suggest trade with southeastern Europe. Together with high 15N in the human bones from Khvalynsk, which might have caused a reservoir effect making 14C dates too old, the circulation of so much copper, which increased in SE Europe after 4700 BCE, suggests that a date after 4700 BCE would be reasonable for many graves at Khvalynsk. Copper was found in 13 adult male graves, 8 adult female graves, and 4 sub-adult graves. The unusually large cemetery at Khvalynsk contained southern Europeoid and northern Europeoid cranio-facial types, consistent with the possibility that people from the northern and southern steppes mingled and were buried here. So this is consistent with the idea that there perhaps was not a long term "Khvalynsk" population well represented by the average of all samples which makes sense as an possible ancestor population for Yamnaya. Instead there may have been some different populations some more similar to the typical pool of the northern steppes, and others to those of the southern steppes and who would make more viable as being ancestors of Yamnaya a thousand years later. In your post last Feb - http://eurogenes.blogspot.com/2017/02/the-khvalynsk-men-2_16.html - I think you had some thoughts in the comment on the post that I0434 might be a bit more ANE rich and with his EHG ancestry from a more ANE rich population, in line with the Q1a haplogroup, and so your models for him in that post (at the time EHG+Anatolia_Chl+CHG) not quite right as a consequence. Do you reckon this bears out at all with more samples or possibly off base in retrospect? Why do you think Iberia groups models so well with Yamnaya? It appears to have a better fit than much closer time/distance individuals? Also, do you think having Ganj_Dareh_N in your outgroups could be influencing how the fit to Armenia populations fit in this model? Kurgans were a fashion in many different places, but they probably meant different things to different peoples. The Kurgans south of the Caucasus were used as communal burials, while on the steppe they were usually single burials. So the Kurgans from Leilatepe may not have had any significant relationship with those on the steppe. My methods have improved since then. I now have better outgroups and references, and more markers. I even use the outgroups in a slightly different way. The ChL/CA Iberians are at the top of the list because they have the best ratios of Anatolian farmer and European forager ancestries. This is actually discussed briefly in Wang et al. 2018. Not sure which page though. Ganj_Dareh_N is necessary in these models, because it adds discriminatory power to the analysis. Considering its age and uniqueness, I don't think it's confounding any of the models. In any case, here's the Armenia_EBA model without it. Still a very bad fit. By the way, Eneolithic steppe VJ1001 comes from a Kurgan burial dated to 4332-4238 calBC. So much older than Yamnaya. Is it CHG in ANE or rather ANE in CHG ? Yamnaya_Kalmykia looks much worse, but it isn't UDG-treated, so it shows a lot more ancient DNA damage. Or, perhaps, I really need the more southerly Eneolithic steppe samples to get a better fit for it? That would make sense too. I recall not too long ago the dominant narrative for Yamnaya formation was pure EHG meeting pure CHG... but EHG/CHG hybrids kept popping up earlier and earlier... so how far back are we talking here? When modeling Khvalynsk, Global 25 runs have a slightly better fit with the inclusion of West_Siberia_N (which is on average 7.5%), but it would be likely due to high EHG levels. And nMonte may not be very reliable. I don't have the means for qpAdm nor qpGraph. And is nice seeing how genetic models of Yamnaya match archeological data well. Modeling the ancestry of Yamnaya as Khvalynsk + Sredny Stog isn't very controversial, and certainly less controversial than what has been done and claimed in scientific literature recently. It's a model that makes sense geographically and temporally and in terms of the archeological, anthropological and genetic data. I'd say that it's the right answer and expect it will soon be backup by more ancient DNA data from the Eneolithic steppes. I certainly would like to see Chalcolithic aDNA samples from Leilatepe (or Leyla Tepe) kurgans, but only because I think they will finally put an end to the speculation that this culture had any influence on Yamnaya. I think nMonte generally works very well with Global25 data, especially when running analyses with more recent (Neolithic and later) samples. But Khvalynsk_Eneolithic I0434 isn't in the Global25 datasheets because it doesn't have enough markers. So yes, it's very nice that I can use qpAdm to run a very robust analysis using this sample, because qpAdm can make use of all of the available markers. Khvalynsk, Sredny Stog look like two products of early PIE-expansion. That would mean I0434 was the standard for Khvalynsk. 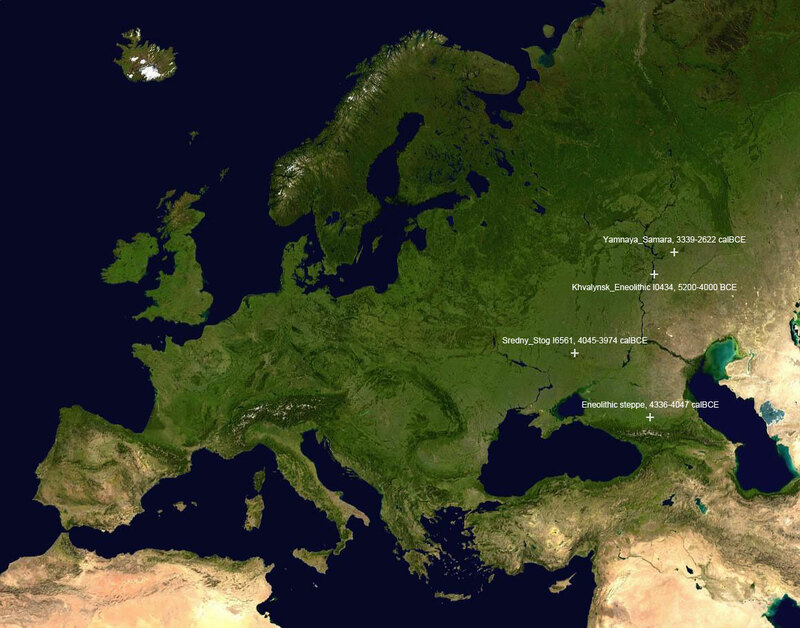 Bronze age Kurgan cultures show an incredible ability to spread across a large stretch of land in a short period of time. I can imagine the first PIE clans doing the same thing. Maybe, a single PIE population essentially conquered much of Russia & Ukraine between 4000 and 5000 BC replacing most of the native gene pool (but mixed with farmers in the west). Then later IE clans: R1b Z2103+ Yamnaya, R1a Z93+ Srubanya, did the same thing but moved on land inhabited by close cousins. I wonder what that WSHG-like admixture (if real) actually is. Importantly, only Khvalynsk seems to have it, and other steppe samples, like Ukraine_Eneolithic/Sredny Stog, seem to lack it. On another note, part of Yamnaya's extra WHG may be from Ukraine_Mesolithic, through Ukraine_N and Sredny Stog (which is also likely to be the source of the WHG-rich EEF admixture detected in Yamnaya). There is no Eneolithic Steppe ancestry in Eneolithic Ukraine. Yamnaya doesn't show up in Ukraine until around 3000BCE and even then doesn't replace the preceding population. Stog, Mikhailovka, Kemi Oba, are all different from Khvalynsk. You need to brush up. You've officially gone off the deep end. No, I haven't. You know nothing of all the Meshoko and Maykop influence in Eneolithic Ukraine. There is no extra EHG there, above what is in Ukraine_N. The eastern ancestry is Caucasus. It fits the archeology. You should actually try reading something for once. You not only do not understand the archeology, but you don't have Admixtools to investigate this. You run on emotion and not evidence. Come back when you have something beyond ad hominem, son..
Yeah, I know Globular Amphora is not the real source pop. But this is why Yamnaya can be modeled with Globular Amphora ancestry. I can't see any input from the Caucasus here. Armenia_ChL didn't skip over Eneolithic steppe to get to Ukraine. The CHG-heavy input in Sredny_Stog I6561 is Eneolithic steppe. Apart from that, let's look at the uniparental markers for I6561: Y-hg R1a-M417 and mtDNA H2a1a. Both steppe markers. Let's wait for the Eneolithic steppe samples from Wang et al. 2018, if the authors are gracious enough to actually release them. You already have the Maykop samples? That's actually Samara_Eneolithic aka Khvalynsk_Eneolithic in his list. Look at that archeology match!!! There's nothing from Armenia in Corded Ware or Bell Beaker. The problem is, as pointed in the last papers (Wang and Damgaard), that the CHG related ancestry found in the Caucasus (Eneolithic and Maykop) and Yamnaya is not the same. Uniparental markers are saying the same. @PF Kurgans found in Georgia and Southern Caucasus are of a different cultural background than the ones found in the Steppe. Read the most recent works by Makharadze. Again, just a stand-in as Armenia ChL is like Meshoko and Maykop. Never said straight from Armenia. Best fits match Archaeology. Yamnaya+whatever doesn't work nor do the parental markers match. My fits also fit this. Did I understand you and your model correctly? Poles in their admixture have a lot of Siberian component. So again they probably used Estonian Poles instead real of Poles. And their PCA looks weird. Again, just a stand-in as Armenia ChL is like Meshoko and Maykop. There's no Meshoko or Maykop admixture in Sredny Stog, Corded Ware or Bell Beakers. The Estonian Biocentre always use the Estonian Poles with Siberian admixture, because according to them anyone who claims to speak Polish as their first language is a Pole and represents the Polish population genetically. Obviously, this is idiotic, but hey, I can't get through to them, so maybe you can have a go? Just e-mail them and ask WTF they are doing? - Armenia_Chl seems a bit different from Maykop and the Caucasus Eneolithic judging by Wang's PCA. I don't know if it so sound to use Armenia_Chl as a stand in for Maykop and may be more useful to use the Armenia_EBA samples which seem to overlap more. - I don't know if it is very sound to use all the Khvalynsk directly with Maykop groups (who are quite separated) when the data from Wang's paper suggest that you have groups already in the southern steppes (the Steppe_Eneolithic from the North Caucasus piedmont) who can generate Yamnaya in a more simple combination. I suppose you could argue that that Yamnaya as Steppe_Eneolithic+WHG+Anatolian is just a chance resemblance and that actually there's lots of unsampled interaction between Steppe_Eneolithic, Maykop, EHG, Ukraine Eneolithic that goes into Yamnaya ("The archaeology says unequivocally that this group must be unimportant!" or something; shades of "CHG went extinct!" assertions of course). And after all, there are only 3 Steppe_Eneolithic samples, before Yamnaya, other than the Steppe_Maykop who are of questionable contribution and seem like they could not be such a major ancestor. But it seems more complicated to me than proposing that the Steppe_Eneolithic (or a group like them that moved out of the southern steppes slightly earlier and are currently poorly represented by Khvalynsk_I0434) was actually largely ancestral to Yamnaya. If you look at the map in my post, I think it's reasonable to assume that the population that contributed the CHG-rich ancestry to Sredny Stog and Yamnaya was probably living roughly between Eneolithic steppe and Khvalynsk. There are no Eneolithic samples from this region yet, but we do have Yamnaya_Kalmykia, which might well be very similar. Also, it may be worth checking for mtDNA C1, C4 and C5. These must be steppe mtDNA outside of NE Europe, Siberia and Central Asia. And also N9a and Y1. C1, C4 and C5 are actually attested in the steppe, whereas it would be almost impossible to find steppe samples with N9a and Y1. Using Armenia EBA. Still a lot of southern ancestry is needed and not a lot of EHG. That is the only sample that needs extra EHG. All the other Eneolithic Ukrainians have no more EHG than Ukraine N has, but need a lot of Southern ancestry that won't come from some pure CHG pop that wasn't around in the Chalcolithic. South of the Caucasus is the only real option.. The qpAdm graphics in the Wang paper (fig 4) has a Late Bronze Age Dolmen culture sample modeled as almost pure CHG, even if it shows a pretty large error bar. I don't think it's at all controversial to model Yamnaya as a combo of other steppe groups. In fact it's plausible if not likely. My point was that *at some time* CHG and EHG had to meet, even if this happened much earlier in and way north from the Caucasus, and that this question is itself interesting and relevant (whether it's related to PIE or not). I do think it's also plausible that Yamnaya are more or less a continuation of Eneolithic_Steppe from the North Caucasus. I guess it's a question of whether "extra" CHG is required which now I'm unclear about, and also to what extent the CHG-rich outliers like Khvalynsk_I0434 are representative of the steppe as a whole. It's very possible that there were still nearly fully CHG people around when Yamnaya were forming, but again, I'm not sure if they are needed. Hope we find out soon enough. If we look at Europe we see HGs surviving at the margins for a long time contemporaneously with farmers. Similarly some "pure" CHGs could've been pushed out by incoming agriculturalists from the south -- this may explain the early trickles of CHG we already see in the Neolithic. As epoch said the Wang paper shows these types at ~1300BC, so it's easy to postulate that they could've existed two millennia earlier. The Crimean mountains may be the source of the extra CHG. After all, mountain populations experience less replacement than lower elevation ones. I'm pretty sure that the answer is Eneolithic steppe individuals like VJ1001 (4332-4238 calBC) with a somewhat higher cut of CHG than Yamnaya. People like this moved into Sredny Stog territory and also gave rise to Repin and Khvalynsk. When these cultures merged, the Yamnaya genotype formed; essentially the same thing as the Eneolithic steppe genotype but with Middle Neolithic farmer admix mediated via Sredny Stog. I was thinking that, with the Steppe Eneolithic population moving to Ukraine via Crimea, and also moving through the Volga towards what would become Khvalynsk. And since Yamnaya has the worst fits with populations south of the Caucasus, and not having the extra Anatolian that Maykop has, it would be not wise to suggest that Maykop gave rise to or contributed to Sredny Stog, since Yamnaya is a descendant of that culture, and the reasons above, otherwise, "Maykop" ancestry would show up in Yamnaya and later steppe groups. Also, it's strange that in that model "Maykop" ancestry would move to Crimea and Ukraine, while seemingly not being present in Khvalynsk, even though the western steppe has always been more densely populated than the eastern steppe. It looks like an attempt to salvage what has been effectively destroyed by the Wang et al graphs. Do others agree with this model, or are their alternatives? Thanks Chad for taking the time to present your ideas. I can't see any input from the South Caucasus in Eneolithic Ukraine or Yamnaya. All of the samples are mixtures in varying degrees of Ukraine foragers and Eneolithic steppe and/or European Middle Neolithic farmers. In fact, it appears to me that Armenia_ChL is a mixture of Eneolithic Caucasus or Maykop and Sredny Stog. The steppe input is really obvious, because Armenia_ChL clusters north of other ancient and present-day Caucasus populations, and one of the samples belongs to mtDNA H2a1, which is a steppe marker and also found in the Sredny Stog sample. Right now, one of the best models that I can get for Armenia_ChL is Armenia_EBA I1658 + Sredny_Stog I6561. But this is just a stand in, because Armenia_EBA I1658 is much younger than Armenia_ChL, so we need the samples from Wang et al. to check this out properly. The Armenia_ChL samples are from the Areni-1 cave complex. This is a really interesting site which shows the earliest evidence of wine pressing, so it may have attracted people from afar, including the steppe, and it's probably not very representative of the Near East or even the Caucasus. In fact, it's now rather obvious, thanks to the samples from Wang et al., that these Armenia_ChL samples are not representative of the Near East or even the Caucasus of that time. So I can't see any link here to what you were arguing. We don't even know if M269 made it to the Areni region at that time. Like I already said, the link to the steppe in the Armenia_ChL samples is mtDNA H2a1, which suggests female mediated gene flow from the north. Oh, that’s Areni-1? Areni-1, as I’ve said, had someone with Y DNA L having red hair and blue eyes (and presumably pale skin). For your point about it not being representative - that could be because R1b M269 (later L23) would have probably been an elite lineage, so I would never expect it to be dominant. But yes, given the Y DNA of the Areni-1 samples, it must have been female-mediated, but is it more likely that women travelled all the way from the Steppe (and presumably a decent amount considering the European features of Areni-1’s phenotype and genome) or that there was simply mixing with a neighbouring tribe? One violates Occam’s razor, the other does not. @Davidski Also correct me if I'm wrong, but mtDNA H2a1 actually seems evidence of Chad's theory (Caucasian mum + Ukrainian dad = Corded Ware), rather than a native Steppe lineage. H2a1 is associated with the steppe and steppe derived populations, Khvalynsk and Sredny Stog included. The only sample in Wang et al. that has H2a1 is Steppe Maykop AY2003. There's no H2a1 in any ancient samples from the Caucasus or Near East, except in Armenia_ChL which also clearly shows genome-wide steppe ancestry. Coincidence? I don't think so. @Davidski I’d have to look into that further, but from what you said I guess H2a1 would be native Steppe. That does lead me to ask though, what is the source of Steppe CHG in the first place? Is there a first culture where CHG pops up on top of the existing EHG? It looks like H2a1 is native to the steppe, yes. And so is CHG, in the sense that it arrived there during the Paleolithic or Mesolithic. That's because EHG shows Y-hg J and CHG admixture. But the oldest steppe sample to date that is mostly, or nearly so, CHG is Eneolithic steppe VJ1001, which is dated to 4332-4238 calBC. I'm guessing that older samples from that region between the Black and Caspian seas will also be CHG-heavy, maybe going back as far as the Paleolithic. How can EHG show CHG admix, aren’t they meant to be independent pure populations? Also wasn’t that Karelian J* sample just EHG, with no CHG? Please note the big differences between those kurgans, and the ones related to Steppe people (which seem to be the result of local evolution in burial tradition). The fact that those Caucasian kurgans are not containing full body, but only some body parts, is very important as it is meaning a complete different cultural signification. You are not taking into account the Wang et al. results on modelizing Yamnaya (or Daamgard et al. by the way). There is no direct contribution from Caucasus Eneolithic or Maykop (Caucasus or Steppe Maykop) to Yamnaya. So, even if there could have been some cultural links (of unknown nature) between Maykop and Steppe cultures, the genetic contribution from Maykop to Yamnaya (and probably all other Steppe-derived populations as CW or BBs) is null. It is very clear from Wang et al. paper, that Yamnaya have the same CHG-like ancestry as Steppe Eneolithic, which is meaning an admixture event dating from at least the Vth millenium, and probably earlier. So, well before Maykop or Kura Araxes, which have a different kind of CHG-admixture. What we see in the IVth millenium (among other things) is Anatolian_N derived admixture, both in the Steppe and in the Caucasus. But of different sources. "Apart from that, let's look at the uniparental markers for I6561: Y-hg R1a-M417 and mtDNA H2a1a. Both steppe markers." Haplogroup H2a1a is a branch on the maternal tree of human kind. Its age is between 4,100 and 7,900 years (Behar et al., 2012b). The present-day distribution extends from Ireland, Scotland, and France in the west to Chitral, the Pamirs, and Baikalia in the east. It looks like a clade that has expanded from the Pontic steppe both toward the west and toward the east. It may in fact have originated among the people of the Sredny Stog culture in the Dnieper basin. They were most likely speakers of some early Indo-European language if not the speakers of Proto-Indo-European itself. I think it is undeniably a "steppe marker" as Davidski has written. Furthermore, the distribution of the entire H2a1 clade is very similar to that of H2a1a, though with a TMRCA that is probably somewhat more ancient: 7,713.4 ± 1,754.3 ybp; CI=95% (Behar et al., 2012b). However, I am less certain about the origin of the H2a ancestress of H2a1. The distributions of the various subclades of H2a(xH2a1) look like they plausibly may have originated in a Neolithic dispersal from Anatolia or Southeast Europe. As for even more distant relations, H2c appears to be a Western European haplogroup at present (Scotland, England, France, Germany). H2b seems to be most well-represented at present among the Sarikoli people of Tashkurgan, Xinjiang in the westernmost corner of the PRC. It also has been found in Gorno-Badakhshan, Altai Republic, Jammu and Kashmir, Pakistan (Pathan and Brahui), Iraq, Rhodes, Russia, Denmark, and in an American who has reported having German ancestry. Behar's estimate of the age of H2b has a very wide confidence interval: 6,446.8 ± 3,980.1; CI=95% (Behar et al., 2012b). "Haplogroup H2 is a branch on the maternal tree of human kind. Its age is between 10,500 and 13,300 years (Behar et al., 2012b)." "Blurb: This lineage was born during the Mesolithic period. Its distribution from Central Asia into Europe suggests an origin in Central Asia. Its presence on the Arabian Peninsula may be due to recent back migrations. Today, this line and its subtypes are 6 percent of the population of Denmark and 8 percent of the population of Norway. 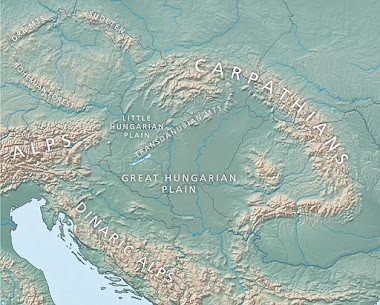 It is about 5 percent of maternal lineages in Slovakia. It is a striking 13 percent of maternal lineages in the United Arab Emirates. Interest Points: The first mtDNA to be fully sequenced, the historic Cambridge Reference Sequence (CRS), belonged to a subtype of this line. DNA from the reputed remains of Luke the Evangelist indicates that he belonged to this lineage." Home-grown like backyard grass (this is an attempt at humor, and a reference to the steppe). On the serious side, steppe CHG is different from Near Eastern CHG because of drift and additional admixtures (WHG and higher ANE in the former, due to interaction with proto-EHG WHG+ANE mixture, and then later EHG proper; Anatolia_N in the latter). The Anatolia_N admixtures are also different, with drift and different admixtures (south caucasian CHG in Caucasus Eneolithic and Maykop, heavy WHG admixture, specifically 40%, in Sredny Stog and Yamnaya) being the cause. "Indo-Hittite" develops on the very late UP/Mesolithic cusp, in the caucuses. One branch of IH speaking foragers slowly makes their way north, where they end up having a large impact, another slowly moves south where they make a significant but slightly smaller one. The languages spoken by the southern branch's descendant groups(Hittite, Luwian, etc.) eventually become absorbed, and by the middle of the Iron age are extinct. Maybe "Indo-Hittite" developed between the Lower Don and Southern Ural Mountains with ANE mixing with Basal CHG ? The image in my head is of IH emerging in the caucuses proper, and then expanding in both directions from there, but your idea may be a little more mature, lol. I'm an amateur so I may not see the proper weight of several arguments, but it seems to me that Uralic and PIE have a very old relationship. There must be a reason they made a significant impact particularly in the developed South. What was it? Hittite expansions are fairly well historically documented. They snowballed into a multi-ethnic empire due to the right timing and circumstances. I've heard this before, not sure what the scholarly consensus(if there is one) is, but my impression is that it was probably a contact relationship, as opposed to a genetic one? It seems to me that we could at this point associate(tentatively)ANE with Uralic, and CHG with "Indo-Hittite", but I'm not an expert either. Another thing that complicates things is that Eastern Europe had two types of pottery, one associated with farming that arrived from Southeastern Europe (and in turn from the Near East) in the Neolithic, and another type, which was used by hunter-gatherers (EHG and Ukrainian HG) since the Mesolithic, and which spread from Lake Baikal (and ultimately from China or the Russian Far East). Steppe folk and descendant peoples have rather complex origins. First, ANE, WHG and CHG intermixed to form EHG. Then EHG migrated westwards, mixing with WHG to form Mesolithic and Neolithic Ukrainian HGs (and who happen to cluster near SHG due to similar WHG/EHG ratios), and to the south, mixing with CHG to form the population known as Steppe Eneolithic. Later, ANF came from Anatolia, and mixed with WHG (pretty heavily at 40%), and the resultant WHG-rich EEF subsequently mixed with Ukrainian HGs and Steppe Eneolithic, forming Sredny Stog. At the same time, Steppe Eneolithic also went up the Volga and some intermixed with EHG, while others ramained the same, with both groups forming Khvalynsk. Also, some Khvalynsk individuals may have a West_Siberia_N-like signal, as it pops up repeteadly between 7.5% and 11.67% in the best nMonte model of it (EHG+CHG+Ukraine_Eneolithic+West_Siberia_N), with the caveat that I don't have the means to use qpAdm, qpGraph or D-stats to verify it. Steppe populations migrated through the Balkans to Anatolia, giving rise to Anatolian-speaking peoples, while Sredny Stog, Repin and Khvalynsk almagamated to form Yamnaya (and Afanasievo being an early offshot that were likely the proto-Tocharians). Yamnaya then expanded out of the steppe. Also, some Khvalynsk individuals may have a West_Siberia_N-like signal, as it pops up repeteadly between 7.5% and 11.67% in the best nMonte model of it (EHG+CHG+Ukraine_Eneolithic+West_Siberia_N), with the caveat that I don't have the means to use qpAdm, qpGraph or D-stats to verify it. This is not an easy thing to confirm with formal tests, because EHG seems to be a serious confounding factor, and the standard error in qpAdm covers the minor Siberian ancestry that does show up. But considering the G25/nMonte result, I'll say that it's likely that Khvalynsk has minor West Siberian ancestry. Check out the update to my blog post. The transition from the Neolithic to Eneolithic in the Eastern European steppe was connected with the intensive contacts of people of the Azov-Dnieper, Low Don, Pricaspiy, Samara, Orlovka and Sredniy Stog cultures with the Balkan population and first with the Hamangia culture. The results of these contacts were some imports: adornments from copper, cornelian, marine shells and pots in the steppe sites and plates from the bone and nacre, pendants from teeth of red deer in the Hamangia graves. The Hamangia infuence in the burial rites of the steppe population was very important and caused to use stone in graves and above them, pits with alcove, new adornments of burial clothes. The strongest impact we have fixed for the population in northern area of the Sea of Azov, where the radical changes in the burial rite and the formation of a new Sredniy Stog culture took place. It was connected with the adoption of new religious elements connected with the formation of the centre of steppe metal working. What the paper calls the Hamangia culture, at that time and in that location, seems to be the more commonly known as the very earliest phase of the Cucuteni-Trypillia culture with the designation Hamangia usually reserved for the much earlier Neolithic, pre-Copper Age culture of the same region. This paper argues that the Steppe burial practices and metallurgy arrived via the Cucuteni-Trypilla culture to the west, rather than from the Maykop or Kura-Axes cultures to the South, which would explain the lack of a Caucasian hunter-gatherer or Caucasian farmer genetic component in the Indo-Europeans, since the Cucuteni-Trypillia culture would be pretty directly descended from first wave Neolithic Anatolian farmers instead. The Khvalynsk, Sredny Stog and Yamnaya samples all do have Caucasus Hunter-Gatherer (CHG) ancestry, and usually a lot of it too, but the key point is that they didn't get this from Maykop or even the early Eneolithic Meshoko population, because Maykop and Meshoko also carried a lot of direct Anatolian admixture. The non-steppe/Caucasus input in Sredny Stog and Yamnaya does appear to be related to the Cucuteni-Trypillia population, but it's minor and seems to have been diluted with forager ancestry from Ukraine. Just curious, what population is most likely to be the source of the extra WHG in steppe populations? The copper jewelry found with the Khvalynsk burials was from the Balkans. I'll have a look if I can find the article or paper where I read that. So does it now look like these steppe populations got their CHG by an indirect route, from European farmers? Or do I read this wrong? Nope, it looks like they got their CHG from the direct route, from foragers from the Caucasus who moved into the steppes very early. "they got their CHG from the direct route, from foragers from the Caucasus who moved into the steppes very early"
This suits my present pet theory just fine. You proved time and again that it is worth reading what you suggest and taking it into serious consideration. Congratulations. Trypillia + Ukraine foragers > Sredny Stog > Yamnaya. Could that be connected to the spread of U5a1a and or U5a1b ? That's too specific for me. You should ask Samuel. So, how does GAC now fit into all this? "Nope, it looks like they got their CHG from the direct route, from foragers from the Caucasus who moved into the steppes very early." Considering the fact that the Dolmen culture at least had the largest amount of CHG in Wang, and considering that two of the three mtDNA's from these samples popped up in Steppe related samples, maybe we can relate them to that. Dolmen ranges from 3000 BC to 1800 BC according to Figure 1, so it might have been an offspring of the Steppe CHG.
Maybe tie that to NW Caucasian languages, which according to Bomhard was a substrate in PIE. It is all speculation, obviously. Furthermore, Dolmen looks very CHG in the qpAdm graphs but so much on the PCA, so I'm not sure what it's worth. GAC might be responsible for some of the western gene flow into Yamnaya, especially the more westerly and later Yamnaya groups. But to be honest, I found the big focus on GAC in Wang et al. to be more than a little misguided, considering that GAC is dated to later than Sredny Stog, which is generally considered to have contributed to the formation of Yamnana and already had GAC-related ancestry. Hopefully the authors decide on a more nuanced picture of this issue in the final version of the paper, instead of taking their qpAdm results so literally. Yeah, I tend to be very critical of the Wang et al. team. But take a look at some of the names on that team. And how about the funding they have? So what are their excuses? They have none. I think that qpAdm model for the Dolmen culture sample is a bit of a red herring. Take a look at the error margin in that model and the ADMIXTURE result for the same individual. I suspect that Yamnaya- and Eneolithic steppe-like peoples already lived in the steppes between the Black and Caspian seas during the Mesolithic, if not earlier. But I'm not married to this idea, and waiting for more relevant samples to see what comes of it. So the non-steppe in Yamnaya and it's predecessors may be more CT than GAC after all, then? Seems to make more sense, especially if the reasoning behind the GAC idea has to do with these researchers taking their qpAdm results too literally, and refusing to think outside the box for a second. "Yeah, I tend to be very critical of the Wang et al. team. But take a look at some of the names on that team. And how about the funding they have? So what are their excuses? They have none." This is what I keep saying. Disgraceful. And we're supposed to assume that the opinion of, say, a determined and astute blogger, is necessarily inferior to the opinions expressed by these research teams? I don't think so. It seems to me that these guys are actually lagging behind at this point. Either that, or they're playing things wayyyy too close to the vest. The admixture that we're dealing with here is minor and might have come from several sources directly and indirectly, including from CT, GAC and Varna, so admittedly it's a very complex issue that won't be resolved unless there are many more relevant ancient samples available. But nevertheless, the idea that GAC was the main culprit as Wang et al. seem to imply looks way off to me. Did they even mention Sredny Stog in that paper once? I don't think so. "The admixture that we're dealing with here is minor and might have come from several sources directly and indirectly, including from CT, GAC and Varna, so admittedly it's a very complex issue that won't be resolved unless there are many more relevant ancient samples available." Sure, and I never want to oversimplify things, but CT has always seemed(to me)to be the most likely source of Yamnaya's EEF type ancestry, considering how they were situated with respect to each other. It looks like the obvious first choice. "Did they even mention Sredny Stog in that paper once?" Another potentially dumb question, since I feel like clearing things up a bit with this new info: Given we remember that fuss about GAC being light haired and eyed, what could have been the largest source of lactose tolerance, light hair and eye pigmentation and their alleles in some steppe populations, particularly if GAC was’t significantly ancestral to them? Could it still be a EEF group, another group of people or are there one too many sources balancing it out? @Them meee, not really a dumb question. My take at the most is what those results on GAC, other MN, Yamnaya, and more generally ancient European samples have shown is that samples within the broad genetic groupings (HG, EEF) have tended to be quite diverse on pigmentation variants checked, it seem that there is not too much consistency in selection (at least over short time scales) and that intra-grouping differences between EEF, Steppe, HG may be more significant than between. It's possible that relatively lighter pigmentation in Bronze Age populations who are Steppe+Middle Neolithic could have a lot of origins from either population, or even be from two populations that didn't have high frequency themselves but were subject to some degree of selection. If we have differences within EEF, there are possibly differences within steppe cultures, albeit it seems tentatively more like the steppe cultures recently diversified so there could be less differences among them. Yamnaya may not (pigmentation wise) be representative of the exact steppe population ancestral to Bronze Age Europeans. The idea of GAC, or specifically GAC from NW Poland / Funnelbeaker from Sweden (Ukraine GAC may not work as well), as representative of ancestors for EBA Bell Beaker / Corded, and hence that to explain pigmentation, is a stronger one because the data seems to match, but there are lots of unsampled factors about. The only bit I'm a bit confused about is that the idea as I saw stated was GAC was ancestral to EBA Europeans, along with steppe populations represented by Yamnaya, so whether they were ancestral to Yamnaya doesn't really affect that too much. Archeologically it looks as if there were some kind of connection between the Danube Gorge populations and the Crimea via beadtypes and toolkits. If this connection was via the Lower Danube and up the Northwest coast of the Black Sea it could maybe be that Hamangia picked up some extra WHG on their way North along the Black Sea Coast....? I found an interesting thesis online about ancient European livestock genomics, and was going to blog about it, but then realized that it's just an abstract, and the whole thing is embargoed for another two years. So I'll just post the abstract here. Anyone want to guess what the sentence in bold is actually saying? This thesis demonstrates the power of the analysis of ancient domesticate genomes of cattle and sheep in order to analyse past population dynamics of the two species. In total 113 whole genomes and 127 mitogenomes of wild and domestic cattle, and 28 whole genomes of sheep, are analysed with respect to domestication and subsequent European migration events. The successes and failures of recovering ancient DNA from archaeological specimens using NGS are discussed, with results supporting previous claims of the prowess of the petrous bone for the preservation of ancient DNA. The analysis of ancient mitogenomes demonstrates a reduction in haplotype diversity as cattle migrated west into Europe, supporting previous publications. Bayesian analysis of modern and ancient mitogenomes demonstrates the divergence of some of the major haplogroups could have been linked to environmental conditions, with the dating of some of these branches occurring for the first time. While the formation of the macro haplogroup T likely coincided with the beginnings of domestication. Whole genome analysis of Near Eastern and European taurine cattle and European auroch, builds upon the mitogenomes analysis. It demonstrates support for the domestication of taurine cattle in the Near East and the subsequent migration into Europe. Migrations, population bottlenecks and admixture with European auroch all contributed to the genetic structure present in ancient and modern day cattle. A transect through the Atlantic Edge of Europe, formed of 77 genomes, suggests cattle population history of this region does not mirror that of the contemporary human population. Additionally, preliminary results of allele frequencies suggest selection for increase milk yields occurring post the appearance of lactose tolerance in European humans. Finally, the demonstration of genetic structure in sheep indicates geographic structure similar to that of modern breeds existed in the ancient Eurasian sheep population, while tentative conclusions are formed regarding subsequent sheep migrations post-Bronze Age. Another note: the WHG portion of Sredny Stog's EEF is likely a mixture of WHG per se and slightly EHG-admixed SE European HGs, such as Koros_HG and Iron_Gates_HG. And the HGs in the Danube delta. And also happened to have some AHG admixture. Yeah, I should have took them into account. So, it appears that Sredny Stog's EEF ancestry formed in steps. First, ANF moved into SE Europe, assimilating Koros_HG-like, Iron_Gates_HG-like and Danubian delta HG groups. Then, it moved north, assimilating WHG. Then, it moved east, assimilating Ukrainian HGs, likely of Bug-Dniester and Dnieper-Donets origin. At last, it mixed with more Ukrainian HGs, as well as Steppe Eneolithic, forming Sredny Stog. There may be also Ukrainian HG admixture in Khvalynsk, as the best model of it (EHG+CHG+Ukraine_Eneolithic+West_Siberia_N, the same one which gave the hints of that likely minor West_Siberia_N ancestry) seems to connect it to Sredny Stog repeteadly (even before Yamnaya), which implies Ukrainian HG admixture in Khvalynsk. ". A transect through the Atlantic Edge of Europe, formed of 77 genomes, suggests cattle population history of this region does not mirror that of the contemporary human population." What does this mean ? Does it mean that Atlantic cattle had more European Aurochs Genes ? Or does it mean that some other Cattle Strains not directly linked to Near Eastern cattle were brought in from somewhere else ? Or does it mean that Atlantic Neolithic/Chalcolithic fringe populations imported cattle from Central Europe rather than Southern/Southwestern Europe implying that Dairy Cattle were came from Central Europe ? Or that Dairy Cattle were rather developed out of the Atlantic Aurochs than from Near Eastern strains ? Slightly of topiC, but the following paper provides some background to cattle and human population dynamics in prehistoric Europe. The genetic prehistory of domesticated cattle from their origin to the spread across Europe - 2015. This study is based on cattle mtDNA. They do reference the 2015 Haak, et al, paper but do not link cattle with steppe population migration. "After 7,000 BCE, domestic cattle populations were transported from the Central Anatolian plateau to Western Anatolia and the Aegean. Much of the original Anatolian and Near Eastern variation (approximately 73%) survived in the first Neolithic cattle that were introduced to Europe around 6,400 BCE. Despite some evidence for subsequent gene-flow with Anatolia and the Near East between 6,400 and 5,000 BCE, most of the initial genetic diversity was lost as cattle spread through Europe along with the Neolithic transition: Via the Mediterranean trajectory, migrating farmers reached i.e. Southern Italy, Northern Africa, the Tyrrhenian Islands, Southern France and the Iberian Peninsula by boat. The low genetic diversity observed in the few genetic data available from these regions points to a significantly low effective population size of cattle arriving in the Western Mediterranean." "Along the second trajectory across the European mainland and without major signs of introgression from wild aurochs, cattle finally reached Central, Western (after 5,500 BCE) and Northern Europe (after 4,100 BCE). Also here, much of the genetic diversity was lost during the move, particularly when cattle were brought to Central Europe by LBK farmers." As suggested in the paper, autosomal DNA would be needed as well as more samples to refine their conclusions. The conclusions don't appear to change significantly based on the thesis abstract above. Some of this may be due to trait selection. As an example there are 3 genes selected for milk production. This may be more interesting since dogs can be used for all kinds of herding. Domestication and uses of the dog in western Europe from the Paleolithic to the Iron Age. Thanks. What are the chances, do you think, of a second introduction of cattle into Europe from the Near East via the Caucasus during the Eneolithic or Early Bronze Age, via, say, the Maykop culture? To me it seems that the quote from the thesis abstract that I highlighted makes this rather unlikely, because the genetic structure of the ancient cattle in the Atlantic fringe doesn't mirror that of the human populations there, which suggests that there's no obvious Caucasus-specific ancestry in the post-steppe migrations Bronze Age cattle. However, I guess it's possible that the steppe-derived populations that moved to the Atlantic fringe mostly adopted local cattle. I would expect the trading of “status” bulls/cattle to have extended beyond Anatolia during the Bronze Age. It would also be reasonable to assume that prehistoric cattle came in pulses with new migrations. Cattle also came from the east in historical times and I would expect that to have happened in the prehistoric past. Bronze Age population dynamics and the rise of dairy pastoralism on the eastern Eurasian steppe: http://www.pnas.org/content/early/2018/10/31/1813608115. Again, ancient autosomal DNA of domesticated animals will help unravel our prehistoric interaction with them. Thank you for the breed information. The use of domesticated plants and animals has always intrigued me by providing another behavioral dimension to our past. I am by no means knowledgeable regarding cattle; however, I was born in Iowa and spent some time on family friends’ farms and confined cattle operations while growing up. http://www.cambridgeblog.org/2016/02/cattle-domestication-from-aurochs-to-cow/. There is a nice picture of the size difference between Aurochs and average domestic cattle. Over the last few hundred years a wide array of different breeds have been created for different purposes including increased size for meat production. It is not surprising that there are wild cattle genes in our herds today. Male Auroch interbreeding with prehistoric domestic cattle herds would be expected and ancient farmers may not have welcomed the event. Indeed, it would be a challenge to attempt to separate animals in the act. From a recent article “Scans for signatures of selection in Russian cattle breed genomes … : https://www.ncbi.nlm.nih.gov/pmc/articles/PMC6113280/ Figure 1 is a PCA a various breeds. An example of a steppe breed is the Kalmyk. https://en.wikipedia.org/wiki/Kalmyk_cattle. And a “Country report on the state of the world’s animal genetic resources – Georgia” A survey of animals along with pictures. Iron_Gates_HG worked ok as well, 0.425 tail, followed by KO1, Latvia_HG, and Loschbour all mid 30s. AG3 with or instead of WSHG was worse (0.2x)"
Karelia_HG with the same right pops: 83% Sidelkino 17% Lepenski_Vir_outlier, tail prob of 0.90 so basically a WHG-shifted Sidelkino. Samara was probably close to the WSHG region, although it's not yet clear whether EHG's were always just a WSHG-WHG cline or if there was a barrier at some point. If it's the former we could say Khvalynsk just descends from slightly more WSHG-rich EHG's, if it's the latter there might have been a later pulse of WSHG to some already formed EHG's. Note that Botai won't work instead of WSHG in the EHG fits, but I don't know if it works for Khvalynsk. If it does that's another reason why a proper WSHG pulse there might be unnecessary. Thanks. I will have a look. Apparently the Kalmyk cattle have horns that grow more from the top of their heads rather than the sides like most other European types.